So far, you've seen the Audi E-Tron and R8 Spyder 5.2 FSI make their 2009 Frankfurt Motor Show debuts. Now, for another revolutionary Audi for 2010, the S5 Sportback. Even though, we've already seen the press shots of the S5 Sportback, there's nothing like seeing a car "in the flesh." These live photos from Frankfurt are no exception. Click here for more information; including full specs, press release and 14 hi-res images! The abbreviation "S" stands for sports and also high efficiency – characteristic Audi features. The S5 Sportback is the top model of the new Sportback model series. The five-door coupe is powered by a highly efficient, supercharged V6 engine with an output of 245 kW (333 hp). Power is delivered to the wheels via the seven-speed S tronic and quattro drive; the innovative sport differential is available as an option. The Audi S5 Sportback is powered by a three-liter V6 with a mechanically driven supercharger. The supercharger sits in the 90 degree V formed by the banks of the cylinders and produces up to 0.8 bar of pressure. Two downstream intercoolers lower the temperature of the compressed intake air for improved filling of the combustion chambers. The six-cylinder unit, which displaces 2,995 cc, embodies the Audi philosophy that performance and efficiency are not mutually exclusive but rather complement each other perfectly. The engine delivers a constant 440 Nm (324.53 lb-ft) of torque between 2,900 and 5,300 rpm. The S5 Sportback sprints from zero to 100 km/h (62.14 mph) in only 5.4 seconds (provisional figure) and accelerates up to an electronically governed top speed of 250 km/h (155.34 mph). The spontaneous response, the powerful thrust and sonorous sound make for a thrilling driving experience. The supercharged V6 unit consumes only 9.7 liters (provisional figure) of fuel per 100 km (24.25 US mpg) on average – a top figure in this performance class. The leading position of the S5 Sportback is further underscored by its drivetrain technology. The top model comes standard with the seven-speed dual-clutch S tronic transmission and quattro permanent all-wheel drive with a slight rear wheel bias. Optionally available is the sport differential. The high-end rear-axle differential transfers the forces at the rear axle between the wheels as needed for even greater dynamism and stability. The Audi S5 Sportback has a sports-tuned chassis. The S-design 18-inch cast aluminum wheels are shod with 245/40 tires. Wheels up to 20 inches are available as options. The black brake calipers are emblazoned with S5 emblems. Servotronic speed-sensitive steering is also standard, with dynamic steering optionally available. A strut brace provides the front section of the car with additional rigidity. A number of features also provide visual cues to the A5 Sportback's sporty nature. The front blade and the diffuser, the single-frame grille, the air intakes, the sill strip, the spoiler lip at the rear and the four-tailpipe exhaust system all sport an exclusive design. The side mirror housings shine in aluminum look and the xenon plus headlights with LED daytime running lights and rear lights are standard. Inside, electrically adjustable S-design sport seats covered in Silk Nappa leather, a black or silver headliner and brushed aluminum inlays underscore the dynamic style of the high-end model. The pointers in the instrument cluster are illuminated white, and the color driver information system presents the S5 logo when the car is started. A leather multifunction sport steering wheel with aluminum-look shift paddles and a sport selection switch for the S tronic underscore the sporty aspect of this model. S5 badges adorn the door sill trims, the key, the steering wheel and the instruments. The luxurious, climate-controlled comfort seats are available as an option. The seat coverings are available in black, brown and three two-color combinations. Inlays are available in carbon, fine-grained birch wood and stainless steel mesh. The metallic structure comprising countless steel fibers feels slightly rough – an extraordinary haptic experience. 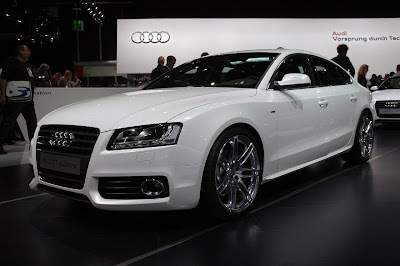 The Audi S5 Sportback will be arriving at German dealerships in spring 2010 with a base price of 57,900 euros.